Jennifer, over at Snapshot created a new challenge for readers who are parents of children. Check out the Read to Me challenge which she has started. It begins Monday, February 19th and runs for two weeks. I will read at least two books to my 4 month old every day. We read together often but I have no set goals around it. Since the Read to Me challenge lasts for two weeks, I figure I can commit to specifically reading TO HIM on a daily basis. With that in mind, we trekked off to the library today and picked up our books! We will overlap them for the next two books as we can take advantage of his enrapturement over the same books (read over and over again). 1. 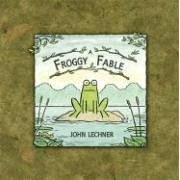 Per Nina's suggestion over at Painted Rainbows, we picked up a copy of A Froggy Fable. 2. I picked up a few more Maisy books, as J2 seems to enjoy the bright, bold colors and artistry of Lucy Cousins. We checked out Maisy Takes a Bath and Maisy Goes to the Library. 3. Of course, when dealing with kids who have no idea what animals are at this point, its important to introduce a variety, right? (Whatever.) 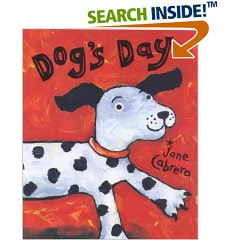 We checked out Cleo the Cat by Caroline Mockford and Dog's Day by Jane Cabrera. I liked these for the same reason that I like Lucy Cousins - they are bold and bright and hold his attention a little bit better than "flat" books do. 4. 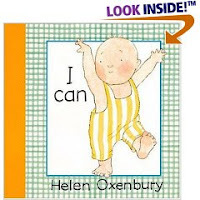 Last week's library stack revealed that J2 rather enjoyed Helen Oxenbury's baby books. We read All Fall Down last week which meant absolutely nothing but we're introducing the idea of language and art right now, right? Baby steps, if you will pardon the pun. He likes pictures of babies -- either real or cartoon. When he is paying enough attention, we'll do whatever the babies in the pictures are doing. So far the only thing that garners a great response is clapping -- which he thinks is pretty funny! This past week we also attended the infant reading time at our library. While J2 did pay a bit of attention to the animated librarian, he was more interested in watching the babies around him perform their various tricks -- like sitting unassisted and crawling around. He stares in rapt attention at any person his size who can move about. 5. Lastly I picked up a few baby board books which will comprise our "easy reading" portion of the list. Duckie's Splash by Frances Barry and a Colors bright baby book. 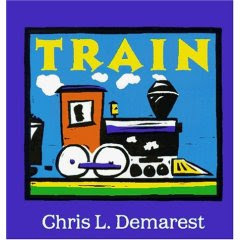 I did NOT return the copy of Train by Chris Demarest that we checked out last week because J2 LOVES this book. He loves the chug-a-chug-chugging and clickity-clacking that must go on while reading. A few times, when he's been a bit fussy, I've pulled out this book and it has settled him down. We live nearby a train track and we frequently hear the trains go by. When we hear them during the day I make sure we get our chugging and clickity-clacking in so that he'll learn to make the connection. It's a lot of fun. Thanks again, Jennifer, for the challenge! I am looking forward to this! Thanks for stopping by my blog Carrie! I have no idea how my post ended up linked from Semicolon, but I'm glad it spurred you on to read a great book. It really is good! Carrie--it's really a bit more than 2 weeks (even though that was what I said--but if you link up and start at the beginning of the week and don't report until March 19. . . However, you can do whatever you want and really track these two weeks. It's the effort that counts! I like your specific list. Duly noted! I realized the miscount when I read your post this morning so I'm glad you clarified. I'm too lazy to change my post so anyone reading the comments can pick up on the time change! I'll still stick to two books a day! Those books look super cute. I may have to search at my library for them! You are going to have so much fun! I'm already missing that stage! My son just turned 1 and my daughter is soon to be 6! I just joined in today and I'm excited and so is my daughter! Have fun reading! Those books look like great fun!